Not a football fan but definitely a sports fan and I'm absolutely fascinated by this story. It's more than the headlines you read in the news. I absolutely listened to these the second they were released. 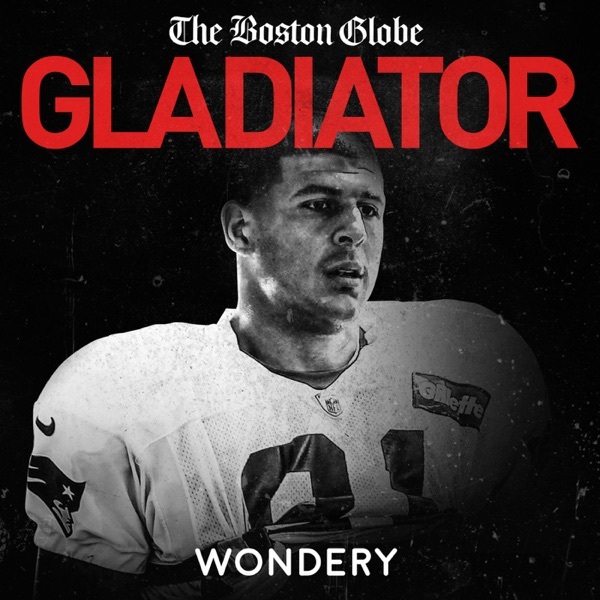 From Wondery, the podcast team that brought you Dr. Death, Spotlight asks: Did a brain badly damaged by football contribute to Hernandez’s violent behavior? Did he keep secrets about his sexuality that collided with a hyper-masculine football culture? Did elite coaches and teams look the other way as Hernandez was spiraling out of control? Spotlight uncovered new documents, audio, and interviews to go deep into the story of what happened to Aaron Hernandez, and what it means for those of us who cheer on a violent game. Sports rivalries can fuel fans and athletes to fight and argue for years. But what’s the real story behind these epic rivalries? From Wondery, the company behind “Business Wars” and “American Scandal” comes Sports Wars, an electric new series that offers an immersive, courtside look at some of the greatest athletic rivalries of all time: starting with Aaron Rodgers vs. Brett Favre. A seemingly-perfect marriage, a nasty divorce, and then...a murder. The first season of Over My Dead Body, "Tally" is available to binge now. The New England Patriots are in the Super Bowl again, and many current NFL players are feeling the physical toll the season has taken. Aaron Hernandez spoke to his former teammates nearly every day from prison: about the injuries they endured, and the drugs they took to dull the pain. Some of the drugs were legal, administered by the teams, but some drugs weren't. The drugs can help players remain on the field. But at what cost? Aaron Hernandez died in 2017 but his life still raises questions. On this special episode Liz Dolan, host of “Safe For Work” and “Satellite Sisters,” speaks with Bob Hohler of the Boston Globe’s Spotlight Team about the making of Gladiator, and the one question he still wants answered. In life, Aaron Hernandez weighed 240 pounds. In death, the most important part of his body was just over 3 pounds. When researchers analyzed his brain they were shocked by what they found. A lifetime of football had seemingly taken a tremendous toll, but could it explain his violent crimes? Brooklinen - Get $20 off and free shipping when you visit Brooklinen.com and use promo code "Gladiator" at checkout. With his arrest, Hernandez traded in his jersey number for an inmate number in the Massachusetts prison system. His voice was rarely heard from again in public -- but he spent hours talking on the phone from inside jail. Spotlight obtained ninety hours of jail calls -- never before heard publicly -- that provide an intimate look at his life and mind in the period before his first murder trial. Aaron Hernandez was enjoying success on the field, but in his third season with the Patriots, the fragile balance of his life tipped. There were people who cared for him trying to intercede, from an old girlfriend to his teammates. But no one could successfully help him escape from violence, drugs, and extortion attempts. Aaron Hernandez was one of eight players who graduated high school early to join the powerhouse University of Florida football team. Six of them would go on to play in the NFL. Forget the senior prom, it was time to learn a playbook as thick as a dictionary. But perhaps the most important lesson he learned was after he got into a bar fight his freshman year: when you're a football player, actions don’t always have consequences. Aaron Hernandez was an exceptional athlete from an early age, a star in his hometown of Bristol, Connecticut. His father was a charismatic ex-athlete still known by his high school nickname, “The King.” He ruled the Hernandez home through fear, and a strong opinion of how he believed his two sons were supposed to act. The long shadow of Aaron’s upbringing -- and his childhood secrets -- would hover over him his entire life. When Aaron Hernandez was found hanging from a bedsheet in a maximum security prison cell in Massachusetts, he joined a growing number of former football players who’d taken their own lives. But he was the only one who left a trail of bodies in his wake. Spotlight investigates how Hernandez’s personal life spiralled out of control even as he rocketed to NFL stardom. His teammates on the Patriots were never sure whether he was a goofball who took a special kind of thrill in unnerving them, or whether he was truly dangerous.